I had heard about Sarah's Key for years and finally had the chance to sit down and read it a few months ago. It was recommended to me because of my love for Markus Zusak's The Book Thief, I was told it was about World War II, but I was given no additional framework for what would follow. De Rosnay's historical fiction novel bounces between Paris in July of 1942 and May of 2002. Without question, this earlier narrative is far more compelling than the second. In 1942, ten-year-old Sarah Starzynski lives with her parents, Wladyslaw and Rywka, and four-year-old brother Michel. Sarah enjoys going to school and exploring the neighborhoods around their city apartment, but the continued rise of Hitler and his Nazi Regime completely alters her life forever when the Nazis invade Paris. At first, Sarah must begin wearing the yellow Star of David to signify her religion. She can feel tension and fear rising as conditions get worse and more and more of their Jewish neighbors are being arrested. [Warning: spoiler paragraph.] A split-second decision later that summer will haunt Sarah forever. When the French police conduct was will be known as the Vel' d'Hiv Roundup and arrive at her family's apartment to arrest the family and send them to Auschwitz, Sarah hides quickly encourages four-year-old Michel to hide in a secret closet behind a bookcase. She locks him in, makes him promise to be quiet during the raid, and pockets the key. The police force Sarah and her parents to the concentration camp and despite attempting everything in her power to escape and get back to Michel to free him, she can never return, leaving him to his own death outside the camps. This was heart-breaking and truly shocking to read. The whole scene is disturbing and emotional on so many levels, and Sarah's attempt to save Michel and hide the key not knowing the consequences of her actions is endlessly sad. Seriously, keep a box of tissues at the ready. Beyond the horrific grief Sarah carries, she must now try to survive the Nazi concentration camps. Her story of family, love, loss, and the feelings that haunt her throughout her life is very powerful. In addition to this storyline, De Rosnay narrates the life of forty-five-year-old Julia Armond which picks up in 2002 in Paris. An American who moved to France, married a Parisian, and is now in an unhappy marriage raising their eleven-year-old daughter, Julia works as a journalist and is assigned to cover the anniversary remembering the victims of the Vel' d'Hiv. Unfamiliar with this historical event, Julia begins a lengthy research process about the infamous 1942 Nazi raid where thousands of men, women, and children were rounded up, placed in terrible living conditions, and eventually sent to Auschwitz. As a way of escaping her miserable marriage, Julia becomes obsessed with learning more about the tragedy and when she learns of Sarah's story she commits to learning what happened to her. Some unbelievable irony occurs in an attempt to align elements of Sarah's 1942 and Julia's 2002 storylines, but as a reader I really wanted Julia to find the truth. In all honesty, I cared very little for Julia's storyline. For me, it was simply a means of learning more about Sarah and an avenue of tying up literary loose-ends. As the narrative focuses more and more on Julia and less and less on Sarah, I became increasingly disinterested though I remained committed to finishing and learning what happened with Sarah. Sarah's story and her feelings about her little brother are unforgettable. As with so many readers, I find tales of World War II very powerful; they sit with you for such a long time as you consider the unbelievable amount of pain and tragedy that hit millions and millions of lives. 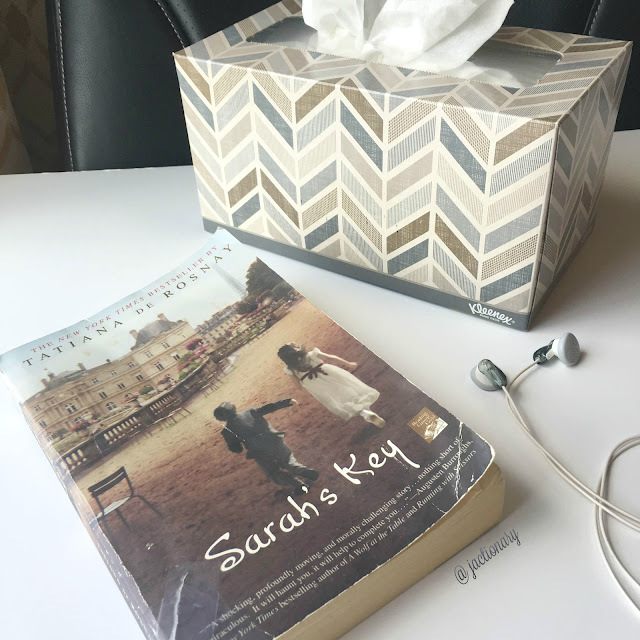 Even though I wasn't engaged in Julia's plot line, I wholeheartedly recommend reading Sarah's Key for Sarah's story and the way the novel portrays innocence and childhood lost. Have you read Sarah's Key? Which WWII historical novels do you recommend I read next?